PT. WadahPanganMakmur is a manufacturing and distribution company that specializes in Premix Flour. Our company has an extensive range of innovative products suitable for Industrial, HORECA (Hotel, Restaurant, Catering) and retail market. Our products is distributed in the local market and also exported overseas. Our retail products can be found in the retail market under the umbrella brand “Mr. Food”. 1. To deliver products from high quality ingredients that is hygienic, healthy, and safe for consumption. 2. To simplify, save time, and increase efficiency in production for Industrial, Hotel, Restaurant and Catering in providing the customer needs. 3. To continuously innovate in delivering products simultaneously with the advancement of technology and market demand for practicality and efficiency. 4. To support government programs in promoting local products and create job force for Indonesia and assist small medium enterprises. 5. To deliver internationally approved products and become Indonesia’s exporter. PT. 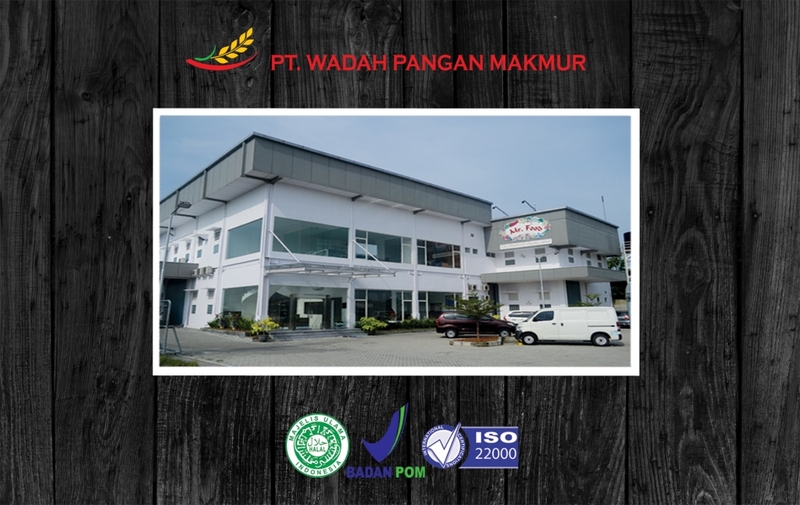 WadahPanganMakmur is certified by BPOM MD RI (Indonesia’s Food Safety Regulation) and has obtained Halal Certification from Islamic Religious Council of Indonesia. In addition, our company is certified by ISO 22000.